Bead, sterling silver, 5.5x5.5mm cube with alphabet letter F and 3.5mm hole. Sold individually. Item Number: H20-3191MB Have a question about this item? 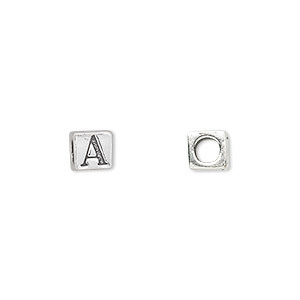 Create personalized designs that really carry a message with sterling silver alphabet beads. Horizontal drill holes make these alphabet beads ideal for adding names, favorite sayings, affirmations and more to a variety of designs. Large 3.5mm drill hole accommodates wide cord and leather laces. Beads feature letters on all sides. Bead, sterling silver, 5.5x5.5mm cube with alphabet letter E and 3.5mm hole. Sold individually. Bead, sterling silver, 5.5x5.5mm cube with alphabet letter R and 3.5mm hole. Sold individually. Bead, sterling silver, 5.5x5.5mm cube with alphabet letter M and 3.5mm hole. Sold individually. Bead, sterling silver, 5.5x5.5mm cube with alphabet letter N and 3.5mm hole. Sold individually. 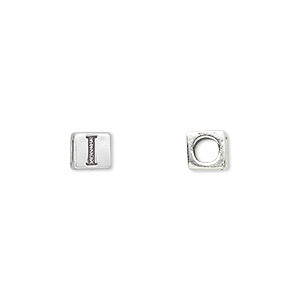 Bead, sterling silver, 5.5x5.5mm cube with alphabet letter I and 3.5mm hole. Sold individually. Bead, sterling silver, 5.5x5.5mm cube with alphabet letter L and 3.5mm hole. Sold individually. Bead, sterling silver, 5.5x5.5mm cube with alphabet letter O and 3.5mm hole. Sold individually. Bead, sterling silver, 5.5x5.5mm cube with alphabet letter S and 3.5mm hole. Sold individually. Bead, sterling silver, 5.5x5.5mm cube with alphabet letter T and 3.5mm hole. Sold individually.